Created by numerous layers of lacquer that are carefully painted on each vase and bowl, shikki, or Japanese lacquerware, is the result of patience and centuries of tradition. While it may be difficult to spot the differences between different regional styles of lacquerware, each piece is part of the identity of a community and holds a special place in the heart of its creator. Kishu lacquerware, called Kishu shikki in Japanese, is no different. Produced in Kainan City in Wakayama Prefecture, Kishu lacquerware has a long history, bringing together Wakayama’s resources and the efforts of local craftspeople. Once known as Kishu, this part of modern-day Wakayama is an ideal location for creating lacquerware. There are abundant sources of wood, lacquer, and the sea shells used to decorate crafts. But most importantly, the level of humidity in this sea-facing area allows lacquer to dry quickly so the craftspeople and artist have time to apply even coats. The Kuroe region in Kainan has been producing lacquerware since the Muromachi Period (1336-1573). Lacquerware is a team effort, as each craftsperson specializes in one aspect of production. There are those who create the wooden base, while others carefully apply the lacquer, paint detailed embellishments, and yet other specialists create the tools of the trade. During the Meiji Period (1868-1913) the local craftsmen worked in tandem with merchants to begin exporting their goods overseas. Kuroe’s specialists organized themselves into an assembly-line, creating lacquerware to ship across the sea. Even their shops were lined up to face the river running through the middle of town, from where the lacquerware would then be shipped out across the world. This innovative (and efficient) method of production allowed them to export a huge number of shikki pieces, to the point that in Europe kuroe became synonymous with lacquerware. However, after the Second World War, there was growing demand for affordable lacquerware that could be produced cheaply and quickly. Plastic-based lacquerware coated with impure mixtures of cashew oil and other chemicals soon became the norm. It can be difficult to tell all-natural lacquerware (tennen shikki) apart from plastic counterparts, especially since both plastic and natural types are labelled as “Japanese lacquerware.” This makes it almost impossible to differentiate them unless you look up the maker. The preservation of tennen shikki now lies in the hands of Kumiko Tanioka and Katsuhiko Hayashi, the only two traditional craftspeople in Kainan who continue to make lacquerware using natural wood and pure lacquer. Although Tanioka is now the fifth generation of her family to practice the craft, originally she had no intention of continuing the family business, nor did her father expect her to follow in his footsteps. “When I left Kainan to study at university, my peers asked me about my family’s business. When I replied that they made shikki, I was surprised to find out my friends didn’t know what I was talking about. I was shocked that something that was such a big part of my life was unknown to people outside of Kainan and found that I had difficulty explaining this tradition to others,” she remarks. Creating a single piece of lacquerware takes boundless amounts of patience, skill, and strength. Lacquer is sensitive to humidity, often requiring days to dry between coatings. Any mistakes must be painted over and redone from scratch. The final step of the process, called roiro shiage, is Tanioka’s specialty. This step requires her to polish the surface of the piece and recoat it seven to eight times. “It takes a lot of effort and I often find myself sweating even in the middle of winter,” she laughs. From start to finish, the process of creating a single piece takes approximately one year. Tanioka realized that Kishu lacquerware was disappearing and felt a responsibility to carry on this history craft. 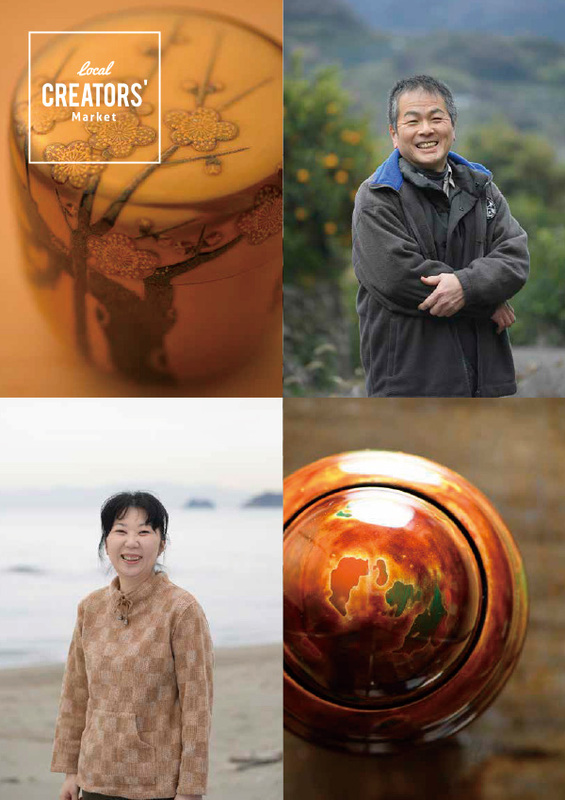 For the past 26 years she has taken on her family’s tradition, while also hosting workshops for visitors and local schoolchildren to learn about Kishu lacquerware and try maki-e, the process of decorating lacquerware with gold and silver powder. Tanioka’s wish is that more people will get to know the tradition and history behind Kishu lacquerware and will continue the craft. While a general decline in demand for lacquerware has made it difficult for craftspeople to attempt new projects, there are also resource issues. Kiji, the wooden bases used in lacquer, are created by specialized craftspeople who carve each bowl and vase from a single piece of wood, hollowing out each piece by hand. The wood is carved so finely that you can see light shining through the grain. Sadly, the last kiji craftsperson stopped creating pieces 20 years ago. Without these special wooden bases, it is difficult to create lacquerware. A maki-e artist, Katsuhiko Hayashi has been creating delicate works of art on lacquerware for over 40 years. Born into a family of lacquerware makers, Hayashi left for Kyoto at an early age to learn the art of maki-e. Confronted with the lack of kiji in Kainan, Hayashi took things into his own hands and started experimenting with new types of bases, for instance using mikan orange peels to create small sake cups. His lacquerware maintains the essence of Kishu shikki while giving the art a new twist. But for Hayashi, lacquerware is not just art but something that is meant to be used every day. “I would love if someone used my lacquerware once a day. That way for at least one meal a day they would experience the beauty of real lacquerware,” he says. Hayashi now creates lacquerware as well as doing maki-e, in hopes of showing others that lacquerware is not just something to be displayed, but rather used and enjoyed daily. Despite its long history and artistry, the future of Kishu lacquerware is uncertain. While artisans search for ways to make this tradition relevant in the modern world, there is still hope that as people around the world discover its beauty and heritage, it may find a place in their hearts and homes.